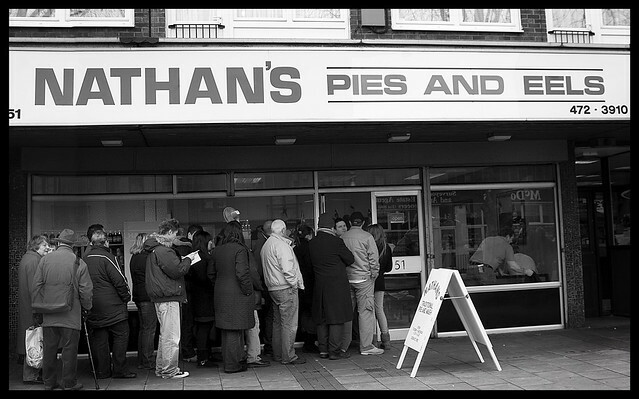 Nathan’s Pies and Eels- even the sign on its own and an empty shop would have been worth a shot. But when I scuttled past and saw this queue outside, I couldn’t turn down the opportunity to capture it. I was hurriedly following two mates in their desperate quest for pints before a West Ham – Manchester United game. The pub on the corner of Green Street and Barking Road was rammed to the gills so we had to look further afield for our pre-match refreshements. It’s a far from perfect shot- you’ll notice the pavement is lurching somewhat, and the quality of the light didn’t really add anything dynamic. I thought the mono treatment might help it some. But it’s still one of my favourite pics from recent weeks!